For most recent updates, check our Faceobok Page! 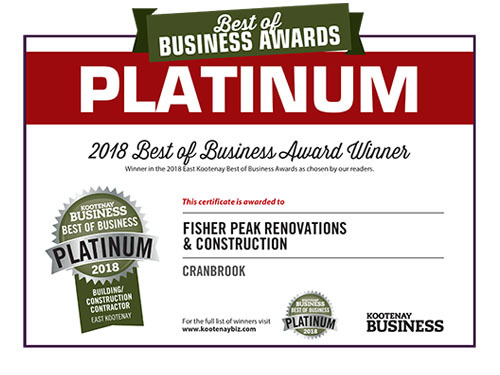 Fisher Peak Renovations and Construction LTD has been serving the Cranbrook area for many years and wants to earn your business. Our loyal customers love our personalized treatment; it keeps them coming back each time a new issue arises. Our customers are like our family. After many years of service in the Cranbrook community, we feel confident that we can cater to your needs. We get the job done and we don’t just meet expectations; we exceed them. Our customers keep coming back because we’re dependable, knowledgeable and pleasant to work with. 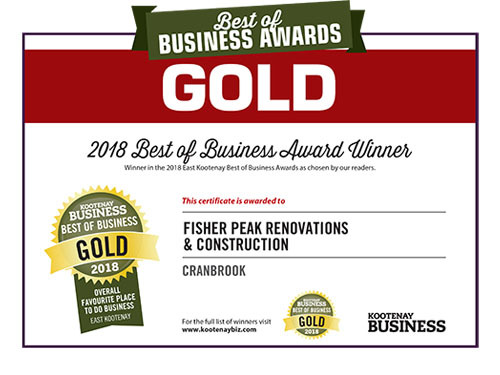 Here at Fisher Peak Renovations and Construction LTD we specialize in making your old home, feel like new, and/or putting those finishing touches on the dream home you are building. In today's economy, not everyone can afford to build, we offer everything from new flooring, to complete basement, kitchen, bathroom renovations/remodels. There is no job too big, and there is no job too small, from a new bathtub and surround in your quaint cottage to a circular staircase with custom handrail in your million dollar home, or that walkout deck off your bedroom on your family home you have always dreamt of, we are here for you. From all of your baseboard, casing, crown moldings, to windows, doors and siding, to new decks, new garages, we have you covered. At an affordable price, we will professionally, efficiently, tidily and most importantly stay within your budget, we will make your dreams and visions come true. 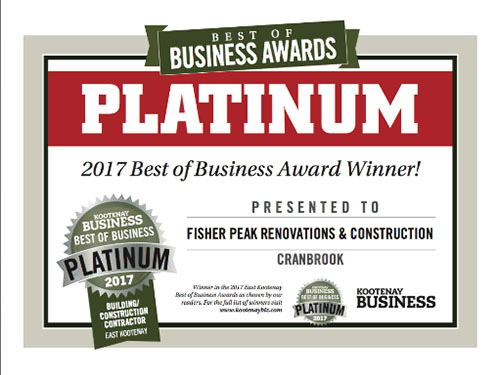 My name is Dustin Willoughby and am the owner/operator of Fisher Peak Renovations and Construction LTD and cannot wait to work with you on your residential or commercial project, call for your free quote today!!! Serving Cranbrook, Kimberley, Invermere, Radium, Fernie, Creston, Sparwood and Elkford, we are your East Kootenays Renovations company. Remember, if you aren't happy, neither are we and won't leave until we all are!